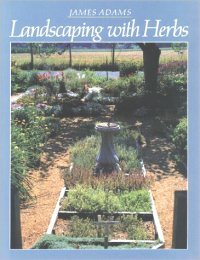 Landscaping with Herbs is an idea book. A book that every time it's read another point of interest is noted. Mr. Adams really loves his herbs and wants to make a successful herb gardener out of each of us. More than that, though, he wants us to expand the way we think of herbs to include common culinary herbs in our landscape. There are six major chapters that include; creating a Fragrant Garden, a Formal Garden for Beauty, a Beneficial Formal Garden, an Informal Landscape, a Contemporary Landscape, and a Wild Landscape. Much appreciated is how each chapter introduces the reader to a myriad of herbs including specific named varieties of well known herbs. For instance, instead of just Thyme, many different Thymes are mentioned and discussed and often a photograph of that plant is included. Also, in each chapter are plans for using the herbs and several color photos of the herbs actually being used in the landscape. This realistic view of the plants is a big help when choosing plants for the landscape. There are also useful, fun tidbits on many other aspects of using herbs including information on Topiary Training, Knot Gardens and Kitchen Gardens. There are recipes too, like Meatballs with Lovage, Oregano, Savory and Basil, that make use of the herbs we grow. A handy chart located at the back of the book lists each plant and many of its physical characteristics such as zone and bloom season. There is also a use chart which lists the landscape use and herbal use of each plant. It is easy to see why this book was honored by the American Horticultural Society as a Great American Gardening Book. Check out our economical 36 pack assortments to landscape your garden.